The Chinese government has made one of the original folk festivals Qing Ming to be a national holiday, so, this week, in my 3 days' holiday, I created a new painting and a new calligraphy to match one of the most famous Chinese ancient poem Qing Ming by Tang Dynasty poet Bu Mu. April 5, is an important Chinese traditional festival --Qing Ming -- Tomb Sweeping Day. It is also called "Festival of March", there is a history for about 2500 years already. 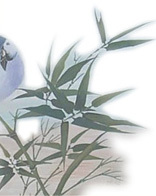 Qing Ming is one of the 24 solar terms of China as well. After this day, there are raining more and more. That means everything will be re-fresh and re-growing up. So, there are many customs to celebrate Qing Ming. Secondly, people like to have a walking, picnic, hike, to enjoy the great nature in the spring season. Thirdly, in different places there are different customs... most of places, people enjoy flying kites, and in the North places, people enjoy playing swing outdoor. a pedestrian's heart would be broken on the road. May I ask where any restaurant is? Please hit any Chinese character that you need help with, to see its Chinese pinyin, pronunciation, and meaning and follow me to read it. If you have any questions, comments and suggestions, please write to shirley@ebridge.cn or shirleyz004@yahoo.com. You are welcome to publish your opinions in Message Board as well.